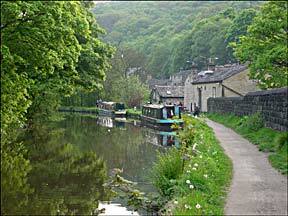 Hebden Bridge is on the Yorkshire side of the Pennine Hills. Not long ago, it was a small mill town producing wool and woollen goods. By the end of the sixties, the town was in bad shape. Shops were empty and blocks of terraced houses were being pulled down. During the seventies and eighties the town was repopulated by a motley mixture of artists, writers, photographers, musicians, alternative practitioners, teachers, green and New Age activists and more recently, wealthier yuppy types. The area has a rich literary history. The Bronte sisters wrote their famous novels just a few miles away in Haworth, the American poet, Sylvia Plath is buried at Heptonstall on the hill overlooking Hebden Bridge and the poet laureate, Ted Hughes was born in Mytholmroyd, two miles away. 2010 marked 500 years of the Hebden Bridge. 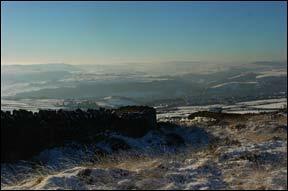 Hebden Bridge's "delightfully relaxed vibe"
New Years Day 2002 - on the tops.